The first and still the world’s best spray stake. Originally introduced by Roberts Irrigation Products, the SPOT-SPITTER is the world’s first nursery spray stake and remains the market leader due to its quality construction and precise water placement. The SPOT-SPITTER is now manufactured by Primerus Products, LLC and sold through a nationwide network of dealers. The SPOT-SPITTER is the simplest and most effective method available for irrigating nursery containers. Its innovative V-Groove design delivers an accurate spray directly to the root zone without waste. The large flow passage stands up to dirty water and can be cleaned by simply removing the supply tube, then putting it back on. Solid construction from UV-inhibited acetal plastic results in years of trouble-free use in the toughest environments, and color-coded flow rates provide easy identification. 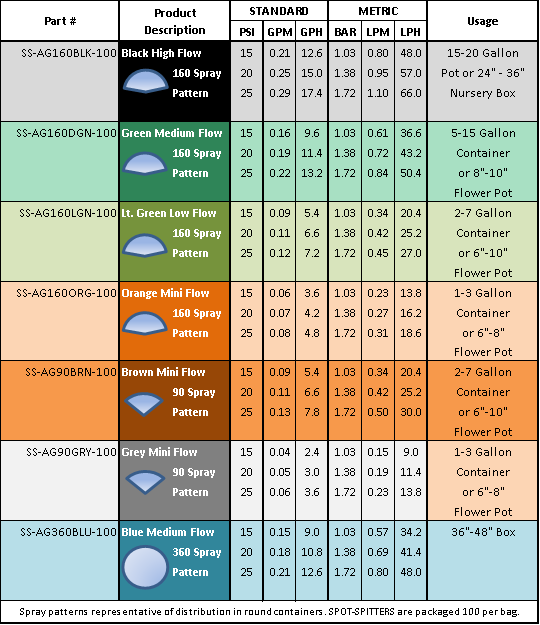 “Avocado Low Flow”, “Terra Cotta Mini Flow” and “Hi-Flow Black” are familiar terms among experienced nursery growers. If you were a SPOT-SPITTER user in the past, we invite you to become re-acquainted. If you are new to the SPITTER, please contact us for a referral to a dealer near you. 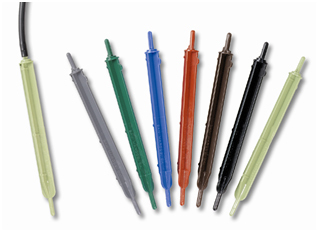 Color-coded SPOT-SPITTERs deliver a variety of flow rates and patterns. Exclusive directional indicator allows quick placement. Available options: Standard (4.75”), short (2.75”), Tall (11”) and Downspray.